Jack M. Balkin is Knight Professor of Constitutional Law and the First Amendment at Yale Law School. He is the founder and director of Yale’s Information Society Project, an interdisciplinary center that studies law and new information technologies. He also directs the Abrams Institute for Freedom of Expression, and the Knight Law and Media Program at Yale. In addition to Yale, he has been a member of the law faculties at the University of Texas and the University of Missouri-Kansas City, and a visiting professor at Harvard University, New York University, the Buchman Faculty of Law at Tel Aviv University and the University of London. 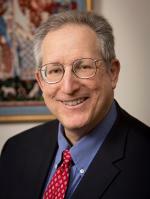 Professor Balkin is a member of the American Academy of Arts and Sciences and writes political and legal commentary at the weblog Balkinization (http://balkin.blogspot.com/). He has also written widely on legal issues for such publications as the New York Times, the Boston Globe, the Los Angeles Times, The New England Journal of Medicine, The Atlantic Online, The American Prospect, Washington Monthly, CNN.com, The New Republic Online, and Slate. Professor Balkin is the author of over one hundred articles and the author or editor of eleven books. His work ranges over many different fields, including constitutional theory, telecommunications and Internet law, reproductive rights, freedom of speech, rhetoric, jurisprudence and legal reasoning, cultural evolution, the theory of ideology, and musical and legal interpretation. His most recent books are Living Originalism (Harvard, Belknap Press, 2011), and Constitutional Redemption: Political Faith in an Unjust World (Harvard University Press 2011).